[By Nick] Serious question, are pomegranates still trendy or have we moved on to the next super fruit? The pomegranate has to be the health food equivalent to bacon. It seems like we’ve combined it with just about everything possible. Now I like the taste of pomegranates but just like my feelings toward bacon, it’s not that special. Now that I alienated myself from the majority of the readers here, let’s take a look at this product. 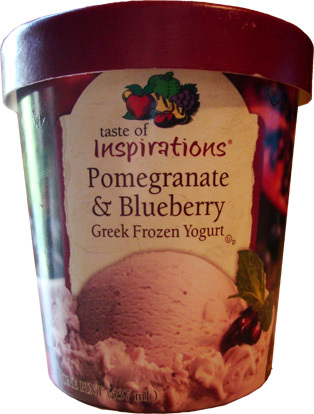 Taste of Inspiration (the Hannaford / Food Lion house brand) recently started producing frozen Greek yogurt and decided to combine the humble blueberry with the super fruit pomegranate. When I think of combinations involving pomegranate, blueberry doesn’t seem all that common of a choice. Strawberry and raspberry seem to be the fruits of choice but it’s nice to see the blueberry getting in on the action. Blueberry frozen Greek yogurt hasn’t had the greatest track record here so hopefully the addition of pomegranate will change that. Right off the bat the color of this is appealing. 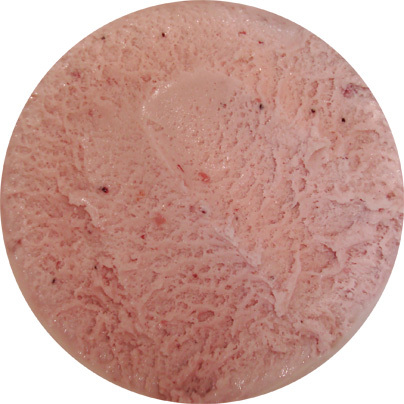 The greek froyo is a light violet which is almost identical to their black raspberry flavor. No I didn’t dig into the pint before taking a photo, some of it stuck to the lid so that’s why there is a nice little whole there. Once I took my first scoop though, I was thoroughly impressed. They actually managed to replicate the flavor of blueberries without any hints of being artificial. 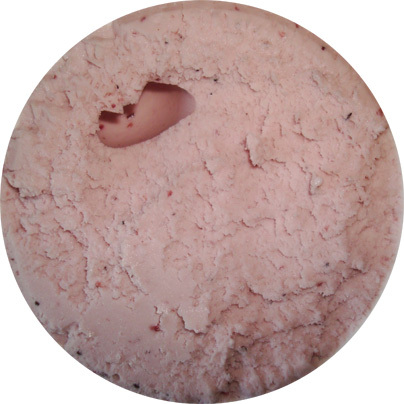 The pomegranate flavor is very subtle and lends an added bit of tartness to go along with the greek yogurt base. While blueberry is clearly the dominate flavor, I feel as if the addition of pomegranate helps to create the natural vibe I’m getting from this pint. I’m truly surprised at how much I really like this frozen yogurt. I’m not going to lie, I thought going into this I would get bored after a couple of scoops but I managed to make my way through about half the pint without even realizing it. The texture is very creamy and fluffy. When I say fluffy I don’t mean that it’s light like a frozen dairy dessert. It still manages to have quite a bit of density to it. The kicker here is the little bits of blueberries spread throughout the pint. They really make the overall experience that much better. They bring up a nice change of texture when you come across them, which is very often. At a price of $2 a pint, I could easily see me buying this flavor regularly. Though the pomegranate flavor wasn’t strong it did what it was supposed to do. It complemented the blueberry flavor immensely and that’s all I was hoping for. *I would love some feedback from you guys. Leave me a comment or send me an email nickrovo at gmail dot com with what you like/dislike, what I should improve on, or even suggest a product for me to try. Being new to the blogging universe any criticism is highly appreciated. Thank you all for reading my reviews as well. Just recently discovered this frozen yogurt and I'm in LOVE! Half the calories of the big name brands AND half the price. What's not the love. The only flavor I haven't tried is vanilla. The coconut-pineapple is to DIE for...best I've ever had. I eat a bit every day. YUM!